Why would an Israeli invasion of Gaza be viewed as a tragic mistake, you ask? Because in the current climate, it will likely be used as a rallying cry to begin the physical formation of Erdogan’s Muslim army for the invasion of Israel. It could also be used by the Israeli false-flaggers as cover for their “cruise missiles out of Yemen” attack on Israel, which they’d narrate as “a proxy attack on Israel by Iran in response to the Gaza invasion.” You can read more about this long-planned operation by scrolling down this page till you see SUBJECT: The false-flag “Houthi” cruise missile attack. Once the buses arrive to evacuate the rebels to Idlib, the Syrian Army will occupy the area with embedded Russian military police. So the stage managers of the engineered Middle East conflict have set up a situation in which Netanyahu has only a few days to invade southern Syria. To do it, he’ll have to arrange a false-flag attack against Israel or produce evidence that Iranians or their proxies are also embedded in the Syrian Army units. Perhaps he’ll do one of his speeches with the silly props or videos. Given the situation, I consider the Gaza invasion more likely than the southern Syria invasion. But if the globalists want to progress towards the “First Battle of Armageddon” sooner rather than later, we could see both. The media are reporting a ceasefire between Hamas and the Israelis. 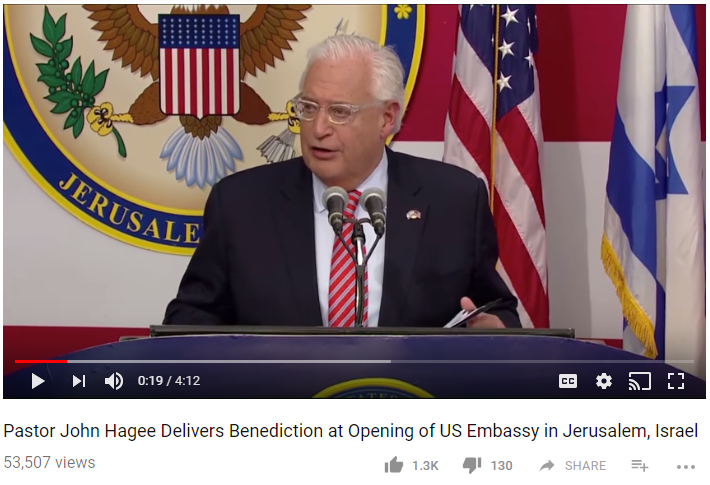 This could mean one of two things: 1) the globalists are backing-off on the Tisha B’Av op, or 2) they are stopping the premature fighting so they can have an explosion of violence once Tisha B’Av begins Saturday evening or it’s the 22nd. We’ll find out soon enough. On the 18th, we looked forward at what they had planned for the Golan Heights and Gaza. On the 19th, they did their first U-turn by suddenly announcing a Golan Heights ceasefire. And on the 21st, they did their second U-turn by suddenly announcing a Gaza ceasefire. I guess the quantum theorists are right: you do change the outcome by looking at it. But just because the globalists backed off from Tisha B’Av doesn’t mean the Golan Heights and Gaza are out of the woods quite yet. There is still fighting going on near the Golan Heights between Syria/Russia and “ISIS” holdouts who didn’t sign on to the ceasefire. And Gaza can be reignited at any time for any reason. So although it appears that the globalists have pressed the delay button for a few weeks or months, they could still fan the smoldering flames in those two areas on July 27, when a “Blood Moon” will appear over the Middle East. If we get through the 27th okay, though, we can rest a little easier. After pondering all this, I’m left wondering if the now-postponed Gaza invasion on Tisha B’Av was meant to be a lead-in to an “Iranian response” during the Blood Moon (in the form of the “cruise missiles out of Yemen” op). That would have been a nice one-two “prophetic” punch. 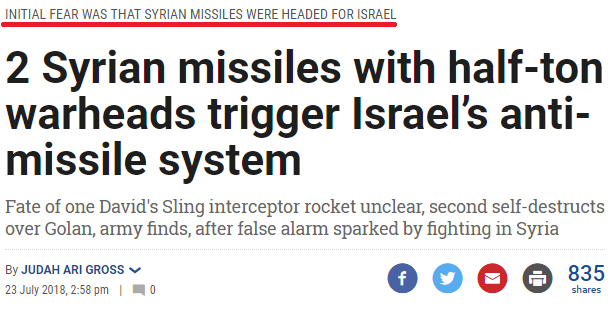 Be on the lookout for an Israeli false-flag / fabricated attack involving an “Iranian” surface-to-surface missile armed with a “chemical weapon,” possibly Sarin (nerve agent), fired into Israeli territory from Syria. This Israeli strike yesterday was part of the setup for it. This attack would be used to justify the Israeli invasion of southern Syria. They also appear to be reheating the Gaza situation. Details tomorrow. The Fateh-110 missile they mention has a range of approximately 300 kilometers. “Israel is sticking to its demand that Iran not be allowed any military foothold in Syria, the official stressed. Israel is furthermore demanding that all long-range missiles be removed from the war-torn country and that any factories producing precision-guided missiles there be shut, the official said. 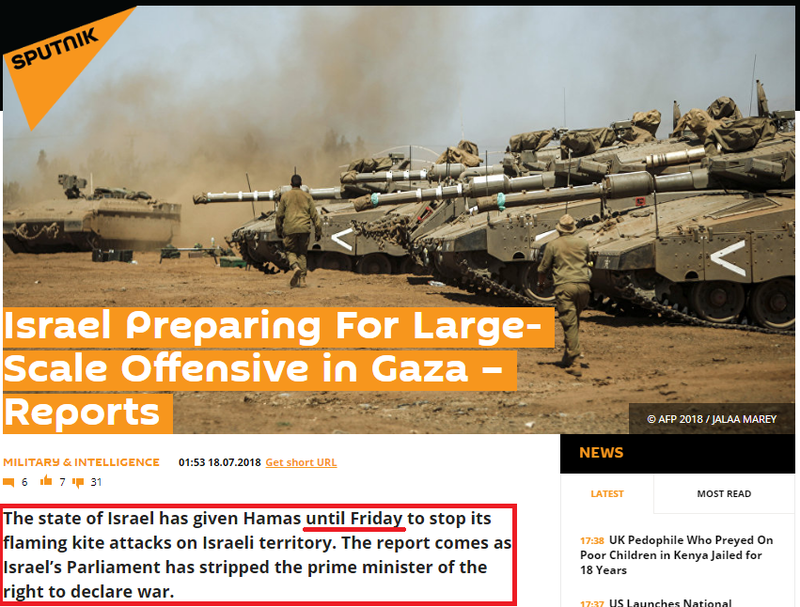 Of course, this geopolitical reasoning is merely the cover story hiding the real reason for all this: the play-out of the “First Battle of Armageddon” part of the globalist prophecy fulfillment script. So they’ve sculpted the search results to finger him for the coming chemical missile attack and give the reasons the US and Israel want him dead. And with Netanyahu vowing to hold Assad responsible for whatever Iran does from Syria against Israel, the stage is beautifully set for the follow-on assassination of both men. 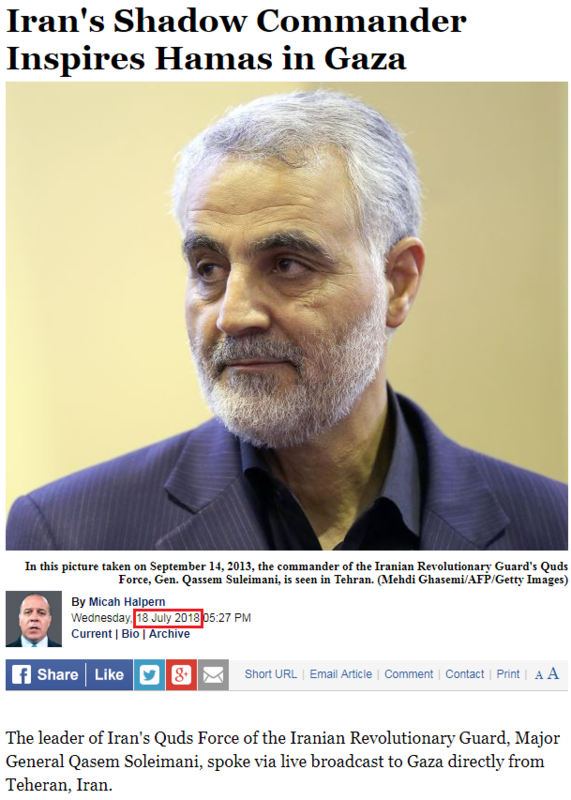 As I’ve written before, Assad and Soleimani will probably be meeting when the hit occurs, and everyone will think the Israelis and Americans did it. But eventually it will be Erdogan who is identified as the culprit. The globalist-scripted Dajjal (Erdogan) must kill the globalist-scripted Mahdi (Soleimani); how could it happen any other way? So will today’s reported sniper attack on an IDF officer lead to Thursday’s heavy-handed Israeli response? And will that response lead to Friday night’s chemical missile attack? 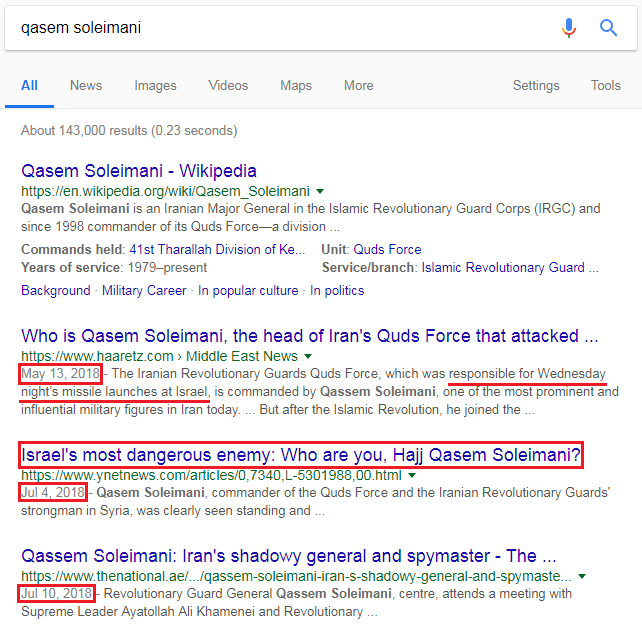 Read the article and see how they build up Soleimani’s legend as a “mastermind,” “maestro,” “Shadow Commander,” and “inspirational icon.” They really lay it on thick. 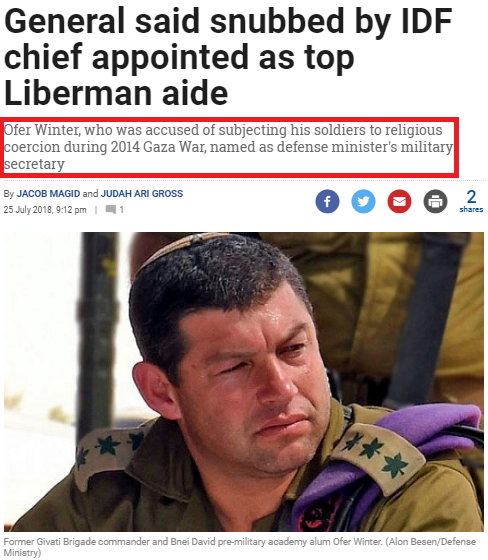 So Israeli Defense Minister Lieberman, who is a Kabbalist with close ties to the Chabad-Lubavitch End Times cult, has brought in another Kabbalist crazy to assist him in launching the first Gog-Magog War. You can read about Lieberman and Netanyahu’s connection to Chabad a little further down this page; scroll down till you see SUBJECT: How and why the Chabad-Lubavitch cult is steering the Middle East towards war. The Gog-Magog War and Battle of Armageddon the Kabbalists are currently fomenting is just the first of two. And between the first and the second, they will fan global “anti-Semitism” into a raging fire that will drive almost all the Jews to Israel. Once this “ingathering of the exiles” is complete, they will burn all the non-Kabbalist, non-elite Jews in a nuclear fire. I warn Jews of this not because I am a fan of the Jewish religion — I find all Abrahamic religions intolerably backwards. So do the Kabbalists. That’s why they’re trying to destroy all obsolete forms of religion and unite the world under a Kabbalized Christianity that they control. The old religions are filled with scientifically implausible beliefs and centered around the worship of invisible sky gods that cannot speak. The new Christianity will be based on scientifically plausible beliefs and a GMO “god” everyone can see and talk to. But even though the new religion will be better than what we have now, it will still be a system of lies and manipulation, so I will not abide its formation. That’s why I warn. …If not stillborn, it won’t last long. And so it is. 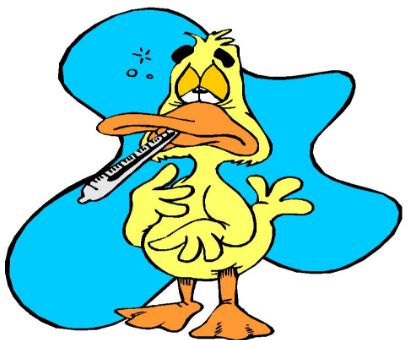 Tomorrow, we’ll look at the easiest way for the globalists to orchestrate the chemical missile attack on Israel: by ordering the Iranians to launch a one-off missile salvo on Israel, and ordering the Israelis to dispatch chemical decontamination teams to some of the landing sites. This would create the illusion that some of the Iranian missiles bore chemical weapons, much like the chemical weapons fakery they’ve used in Syria. We’ll also look at how they’ll time the attack, with the first window being around 11:11 PM Friday night in Israel. In the coming days/weeks — and possibly tonight during the “Blood Moon” over Israel — I’m expecting the globalists to have their Iranian minion Qasem Soleimani launch a large, one-off salvo of conventionally armed missiles and rockets at IDF targets in Israel (and possibly American ships and bases too). This attack would be done through Iranian proxies: the Houthis in Yemen, Hamas in the Gaza Strip, and Hezbollah in Lebanon and Syria. “Soleimani’s” goal in doing this will be to raise Muslim morale and deter Israel and America by shattering their sense of invulnerability. 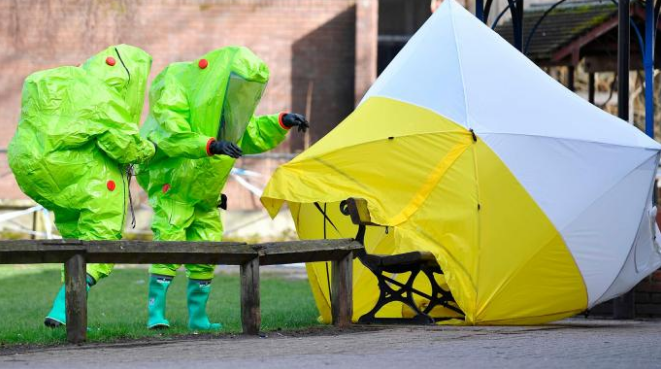 This fabricated chemical attack would be used to justify an immediate Israeli incursion into southern Syria. Things like this show you why this stuff must be taken seriously. If I were a betting man and had to pick a specific time for the attack, it would be 11:11 PM as the eclipse approaches its maximum (that’s 3:11 PM Texas Time). As I post this, it’s just a little over three hours away. Should we get through the eclipse unscathed, I’ll show you another timing indicator they’ve given the public. >>> The official claimed Israel supports “terrorist centers” in southern Syria and shot down the jet to stop the regime’s operations against them. And here is the inevitable response: Hamas calls on Muslims to defend al-Aqsa mosque. At first glance, you might not think the two stories are related, but Assange’s imminent expulsion from the Ecuadoran embassy will at some point lead to the release of his “insurance files.” And if that happens before Putin’s visit to Washington, it could set up a kill-or-be-killed situation between the “Deep State” and their supposed foes, Trump and Putin (Trumputin). Such releases would likely occur in the August – October timeframe, before the US election. And if they happen before the next Trump-Putin Summit, they would provide a great setup for the Washington, D.C. / New York City Nuclear 9/11 the globalists have planned. 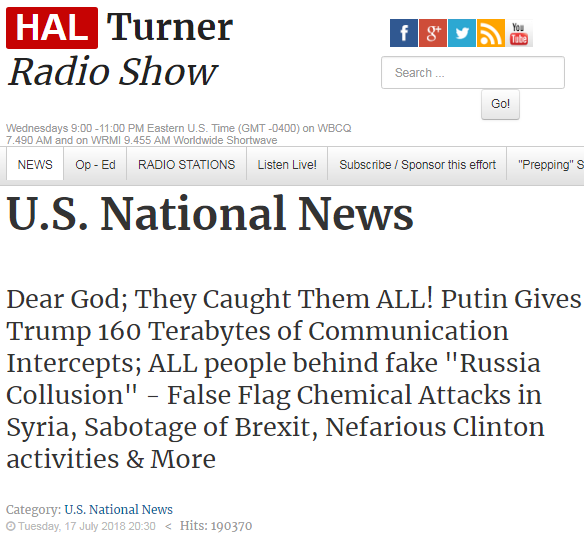 The “evil Deep State” would do it while Putin is on their home turf (Washington), and since Medvedev is supposedly allied with the West, he’d go along with the false-flag cover story. To be clear, Assange is merely a front for the globalist intelligence agencies, and his “insurance files” are nothing more than a limited hangout mechanism through which those agencies will release carefully selected information to support the globalists’ East vs. West NWO conflict. The “Deep State vs. Trumputin” drama is entirely fake, but the consequences for Washington and New York would be quite real. By the way, they are scheduling Putin’s visit for the fall, and autumn begins on September 22 this year. So if they opt to schedule Putin’s visit on that day, they’d have “the energy of the master number 22″ and the symbolism of “the first day of the fall” going for them. We’ll just have to wait and see if they want to be that obvious about it. To read the previous entry, click here: Assassination Watch: Helsinki (completed). This entry was posted in Overwatch Entries on July 29, 2018 by kenneth.